Oh tis the season to be jolly and deck the halls with balls of holly and all of the fa la la la la’s are ringing through my head! Why? Well, I have been having a merry old time busying myself about preparing for Christmas my friends! With a little Christmas Wrapping here, and a little baking here, and oh some decorating here! I thought I was almost done when I saw something darling on clearance and this girl can’t resist a deal! 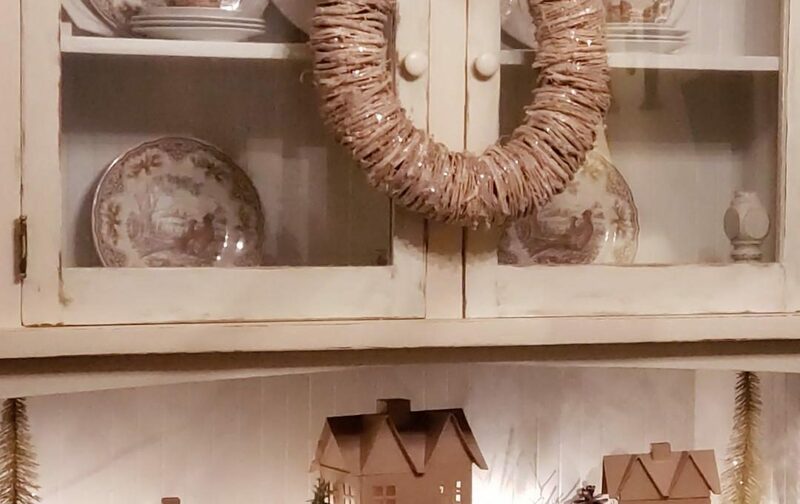 So I scooped it up, joined some friends, and we’re sharing our little Clearance Challenge Blog Hop with you that’s all Christmas-y and Merry! So let me tell you all about my great find. 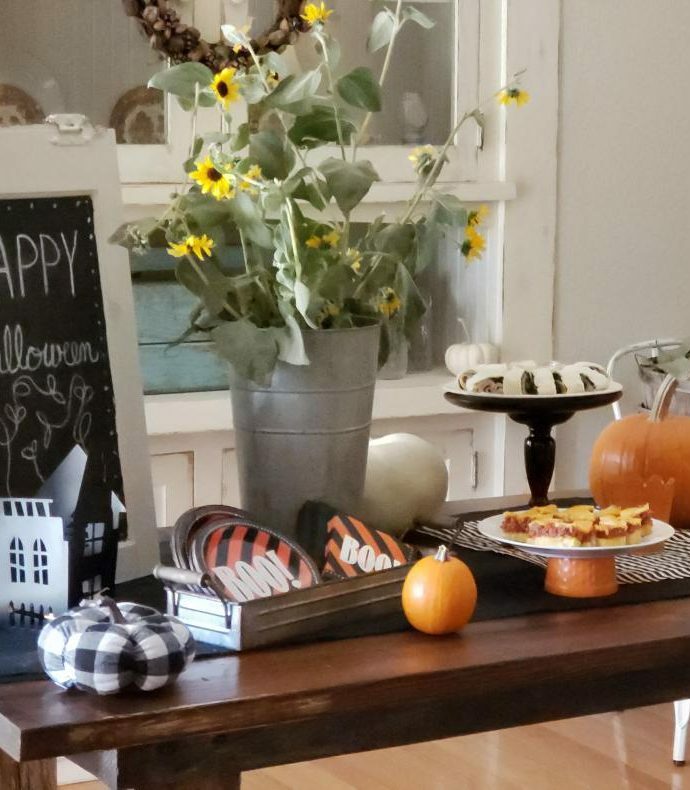 If you know me, I’m all about the Farmhouse Style (living in an ol’ 1912 farmhouse kinda does that to a girl) and I just love me some natural woodsy gardeny goodness. 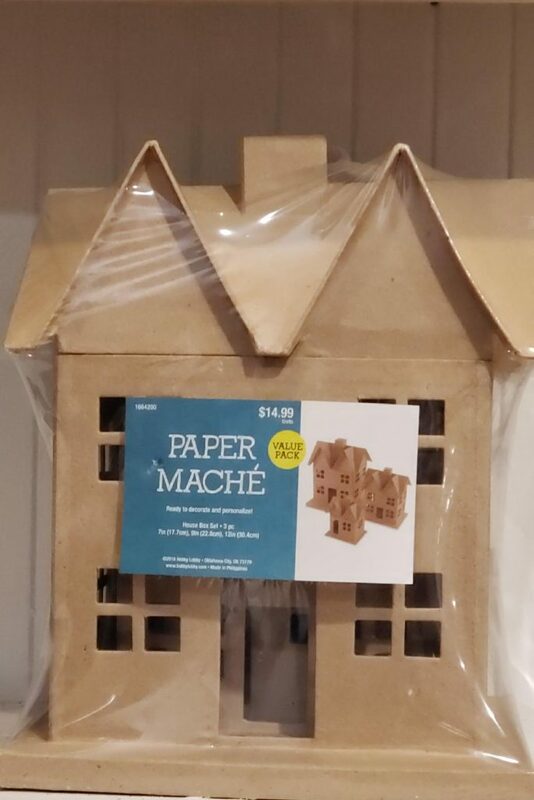 So when I saw these cute little paper machet houses at Hobby Lobby on clearance, I was like, “Wow, those are so cute, and would look so darling in my cottagy home. they were only $7 and we could only spend $15. I love it when I come in way under budget! 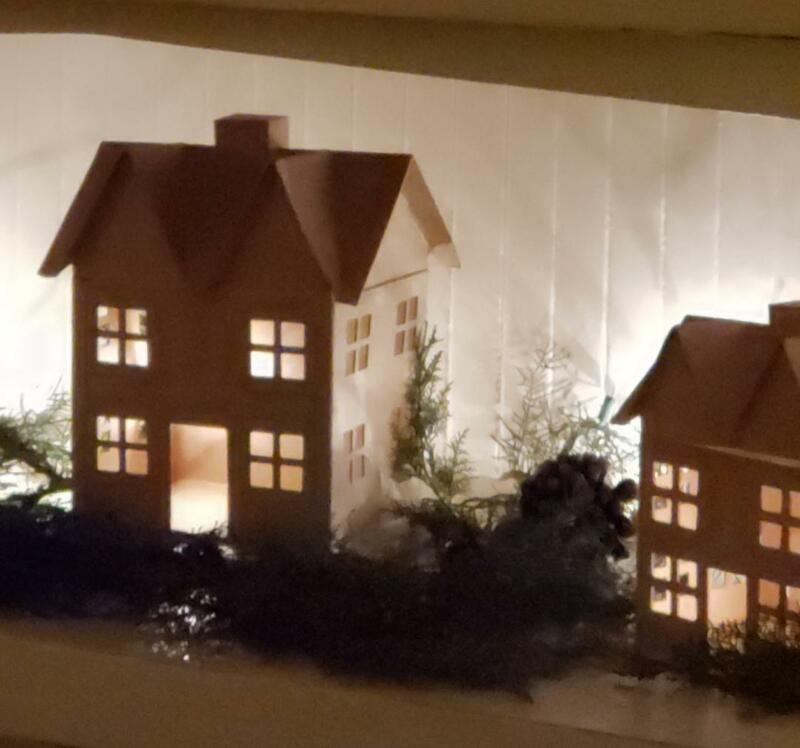 So I thought hmm, I might paint them to make my own cute little Christmas village display, but I might not because this tan au natural simple goodness might just be the thing I was looking for to finish off my Christmas Decor this year! I got them home and loved taking them apart (they were so cute all stacked inside each other like a cute Faberge egg! 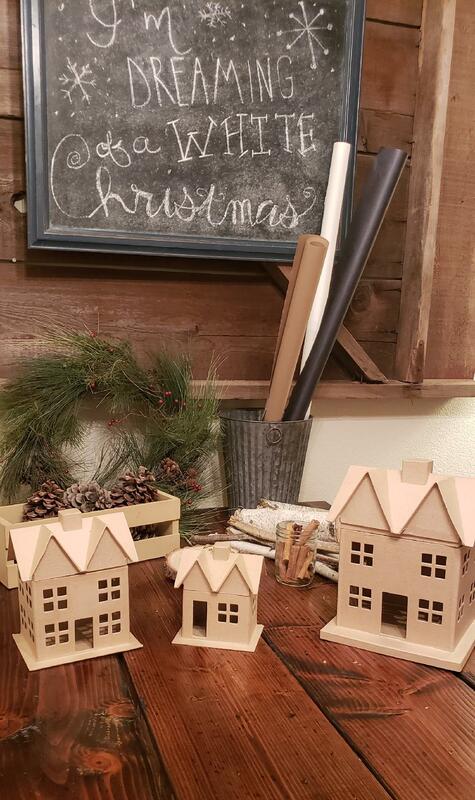 I walked around the ol’ farmhouse deciding on this future little Christmas village’s display place. Ultimately, I thought in this little nook where old built in hutch is. 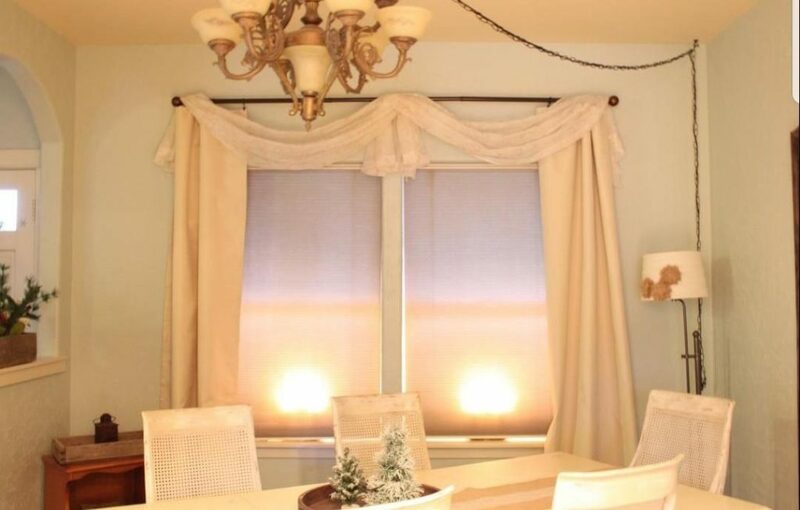 It even has an outlet at the top of the nook so I could plug in lights and weave them in and out through the village. I debated on fluff for a snow look, (my theme this year is “I’m Dreaming of a White Christmas” for goodness sake) but now, I really think the fresh pine and cedar greenery from our yard is what I want and maybe especially because this year we got our first fake tree, so bringing in the fresh garland here and there adds to my enjoyment of the fragrance and look of what I love and miss about a real tree! Friends, I let them be. They’re just so cute and country farmhousey left alone and then set amidst the greenery with it’s muted down brown goodness, it was just kinda perfect. I put a strand of Christmas twinkle lights in and around them to light everything up when it’s dark so it can really shine and twinkle! I love how the different sizes of them add dimension and interest. I also love how it’s simple and brown that compliments my dishes in the hutch. 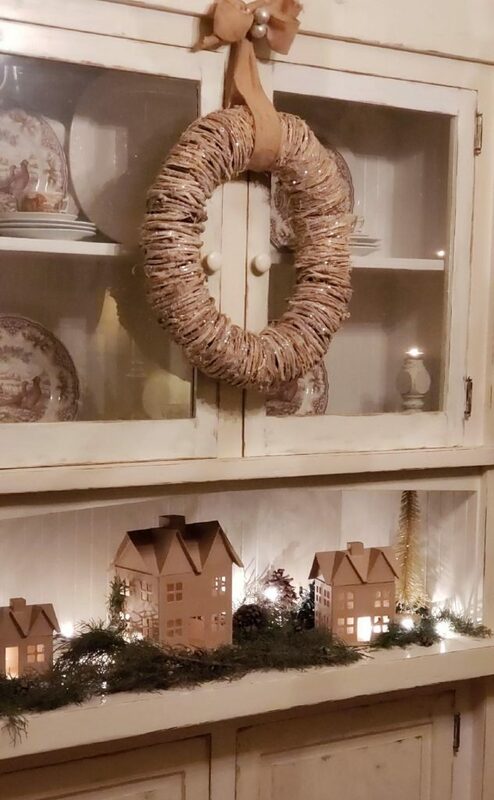 Then I already had this neat wooden ribbon wreath with a touch of sparkly glitter and with these golden sparkly bottle brush trees that I already had also, they really coordinated. Pretty cute I’d say! 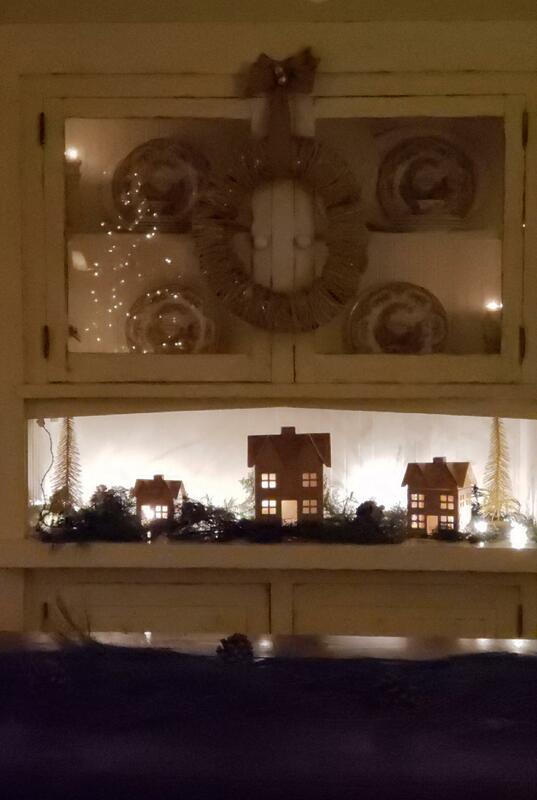 It smells nice, looks darling, and I love the twinkle of the lights shining and showing this cute little Christmas Village off, especially when we eat dinner here at the table next to it! 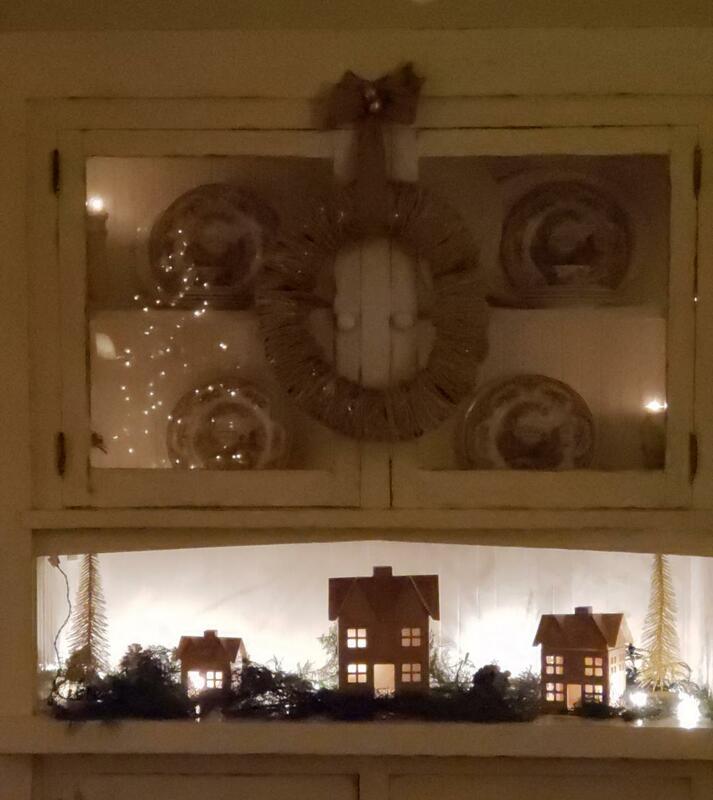 What a wonderful holiday mood is created by this sweet little vignette! What a treat we have in store for you! 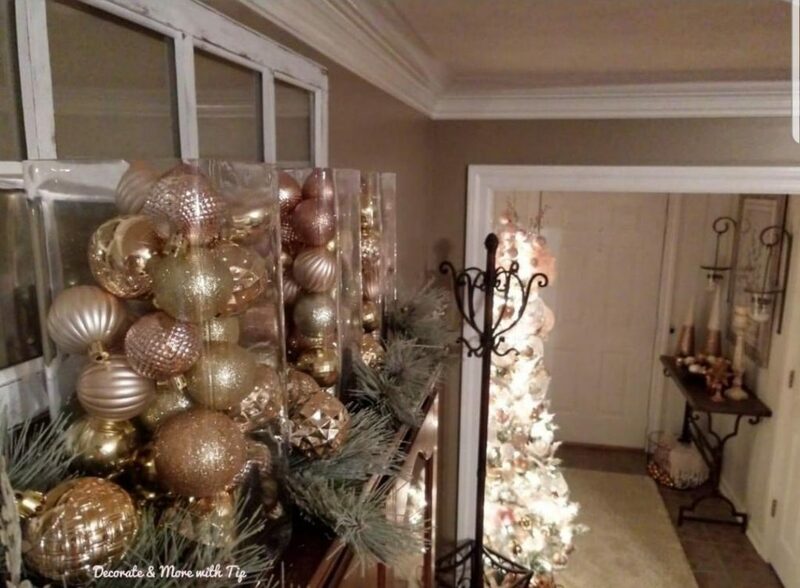 Please stop by my friends posts for some more Christmas Décor Inspiration! Just click on the links below! How cute are these? I love that you left them as is. They fit perfectly in that space!! I love this, Jerri! 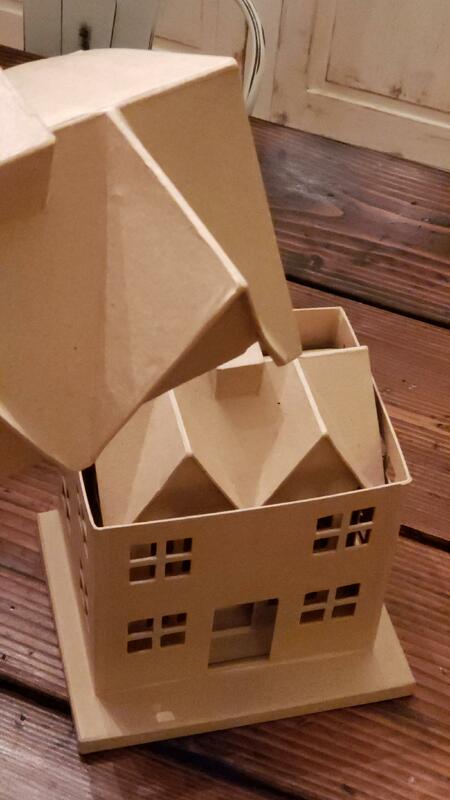 Now I’m dying to rush off to my local Hobby Lobby to see if mine has any of these little houses on clearance! I love the twinkle lights and the fresh greenery you’ve added here. 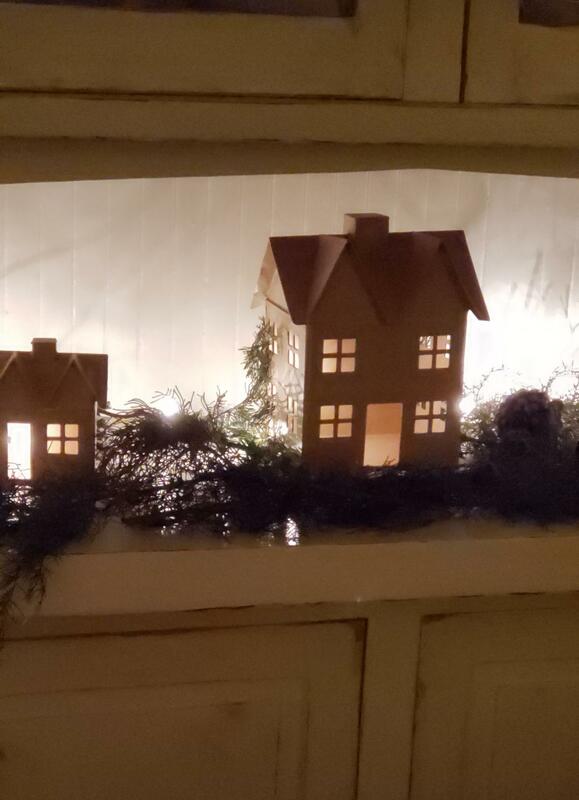 I just love the glow of these farmhouses with the greenery and lights. 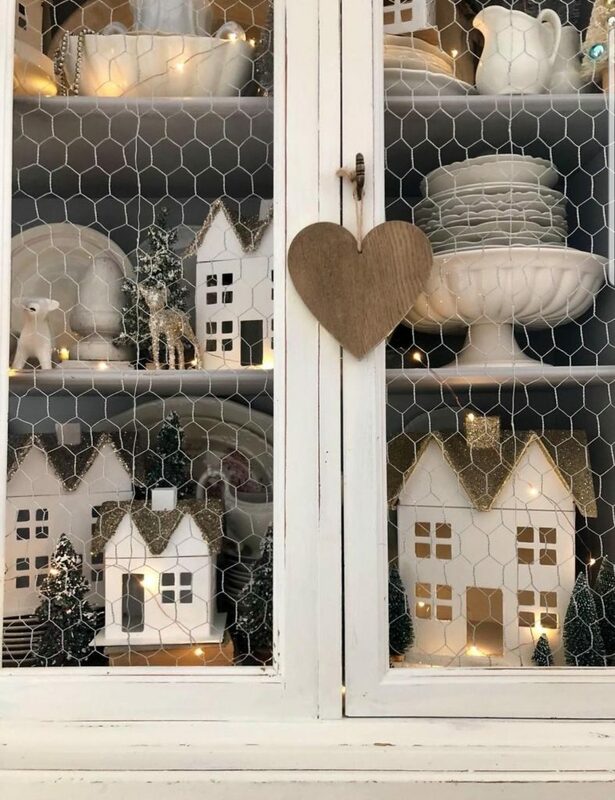 Perfect for your farmhouse and white Christmas theme! Hope you have a merry Christmas! I am in awe with these little homes. What a great deal! I would of never even of thought twice in picking those up. Now I want to go grab them. You really gave us all inspiration. I love working with you on this challenge. Was so much fun! Have a great Monday! It is always a pleasure working with you Terrie! You are so inspiring! Jerri, I love the natural paper mache!! I almost kept my natural, and now seeing yours, I probably need to go back and grab some more and keep them natural! They look so perfect in your darling hutch!! 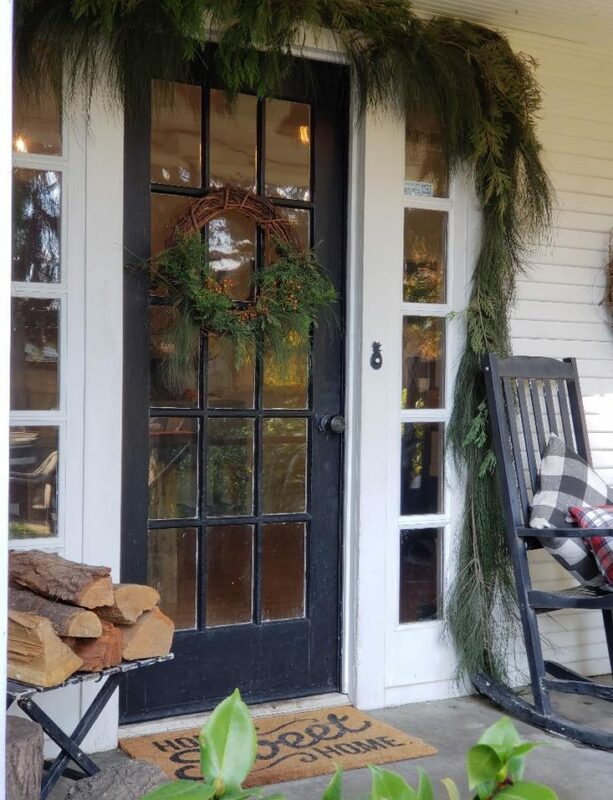 And, that wreath is darling too! Seriously loving what you have done!!! Oh you are so sweet Emily and you know I felt the same about yours! Why did I leave it natural, I said, I should have painted it like sweet Emily’s! I love, love, love them! 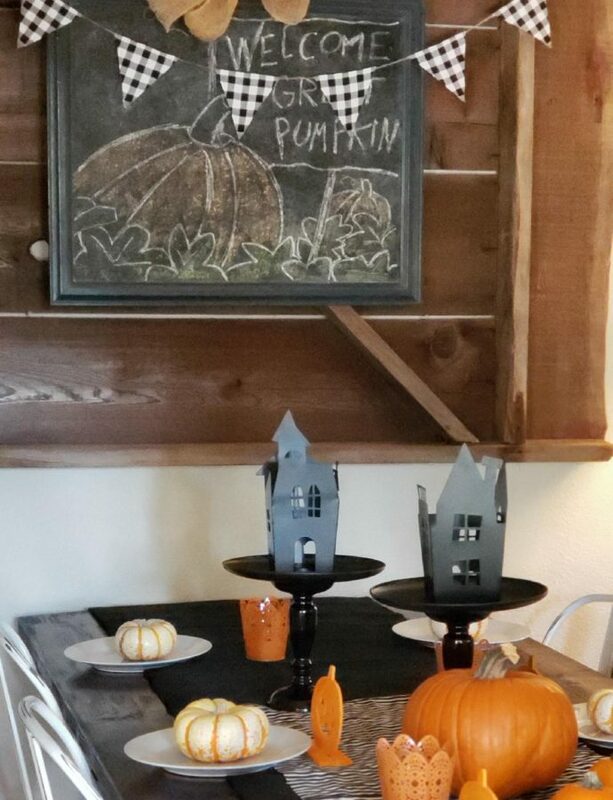 They are so perfect in your home left natural. (I wonder if there are any left for me to pick up.) 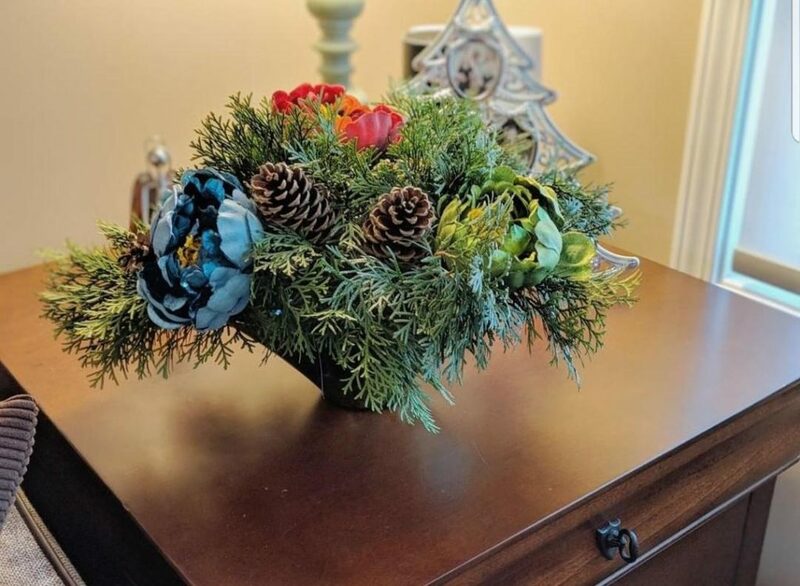 This is such a sweet addition to your Christmas decor.